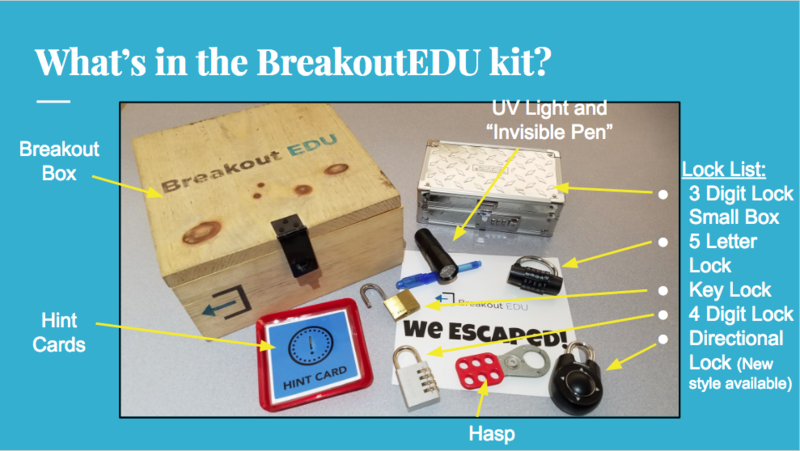 EdTech Blog Breaking Out can help students "Break in" to content! Breakouts are games designed to challenge student teamwork and problem-solving skills infused with lesson content. 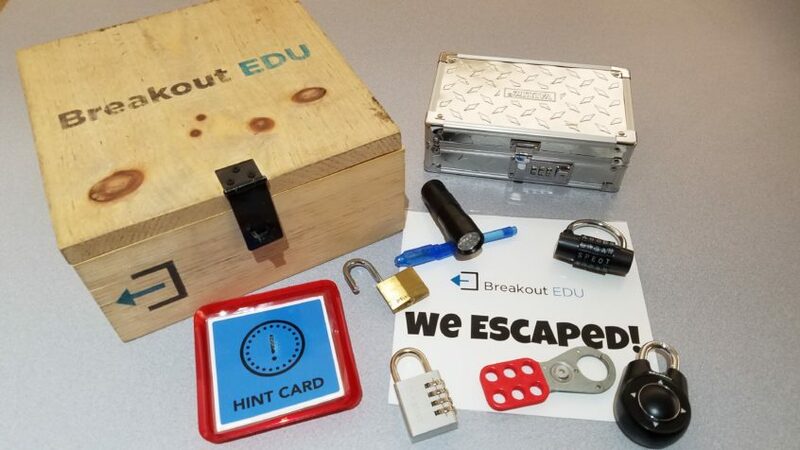 While this may sound daunting, it can actually be very beneficial for students to think “outside the box.” Similar to an “Escape Room”, except instead trying to get out of a locked room, during a Breakout the students will solve clues to unlock the Breakout Box. With this game there are different styles of play, both physical and digital. Games are usually based on a theme, which can be academic and used to accent a lesson or topic. Personally I have facilitated games about reading, math, science and social studies – but the game can be adapted for almost any subject. Keep in mind that not every subject might be appropriate for a game. In our district we have played with lower elementary students through adults! 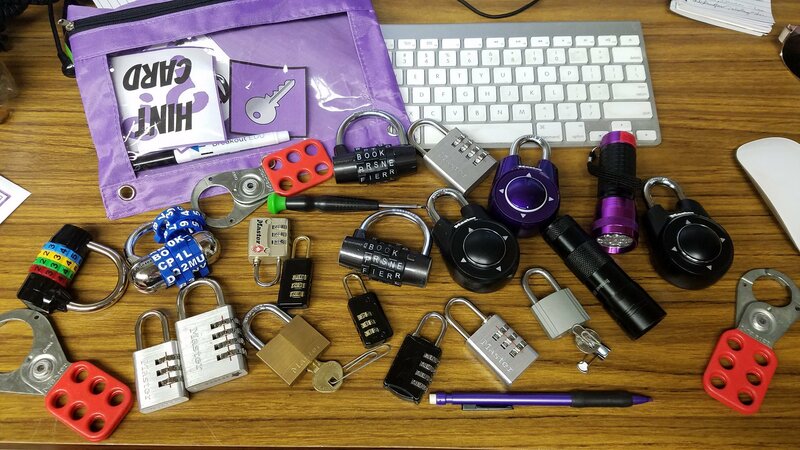 Depending on the level of students playing, games may have 3 to 5+ locks and clues to solve, generally before time has expired (which assists students to learn time management and how to work under pressure.) Clues can be hidden, posted for general use or even locked in smaller boxes to discover. Overall the experience can challenge your class in non-traditional ways and still accent your lessons. What is in a “traditional” breakout kit? BreakoutEDU (breakoutedu.com) is a “freemium” (free/paid) site that is one of the more recognized sources for breakout games. They are commonly one source to purchase kits. Pic 1 (right) is an example of a “standard” kit. 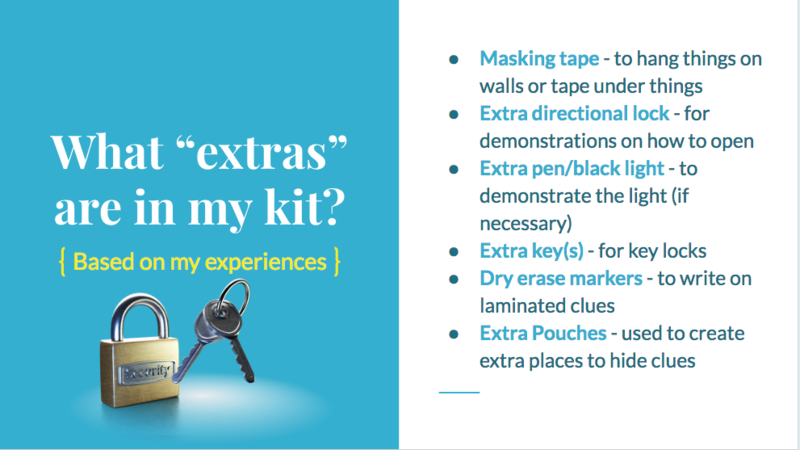 Most of the BreakoutEDU games use this basic kit as a starting point for their games. How has my kit evolved? After playing a few games, or possibly creating your own, you may wish to expand your kit or how you play. For example, if clues need to be printed in color, you may wish to laminate those clues to use again. When playing with more than one team, denoting each team’s supplies by a sticker or color can help combat confusion. I have started playing with different colored teams. Students know they can only take clues or objects with their color and to quietly ignore any other team’s clues. As mentioned before, sometimes there are not premade games available. Some of the games may require you to procure different locks or objects in order to play the game (although generally you can adapt those clues to use the basic kit.) Once I started creating my own games, friends helped me acquire lock cast-offs until I had amassed a desk full of options. Interested in Playing (or Creating) a Game? If you are interested in playing a game, we can help! The district has a box (and we have access to another if needed.) We can come into the classroom, assist you with set up and stay to help run the game. This game can be termed as “contained chaos” the first few times you play; please don’t let that deter you from trying this with your students. Just as we challenge ourselves to do something new, we can learn a lot about our students when they are put into different learning situations. If you would like to try a game (or possibly brainstorm to create your own), please email me (Rebecca) to get started.